"A truly one-pot meal! 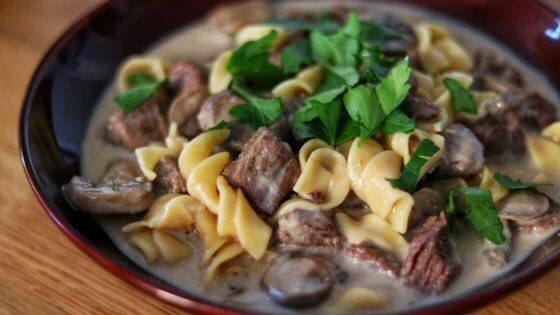 Fork-tender beef and mushrooms with egg noodles. This recipe is written using the Instant Pot®." Turn on a multi-cooker (such as Instant Pot(R)) and select Saute function. Heat oil for 1 minute. Add onion and 1/2 teaspoon salt; cook and stir until onion begins to soften, 3 to 4 minutes. Season beef with 1 teaspoon salt and pepper. Add to the pot. Cook and stir until browned evenly on all sides, about 2 minutes. Add garlic and thyme; cook until fragrant, about 30 seconds. Pour in soy sauce. Stir mushrooms into the pot. Stir in flour until evenly incorporated. Pour in chicken broth and remaining 1/2 teaspoon salt. Close and lock the lid. Set timer for 10 minutes. Set to high pressure according to manufacturer's instructions, 10 to 15 minutes. Release pressure carefully using the quick-release method. Open pressure cooker; add egg noodles. Seal and bring to high pressure again, about 5 minutes; cook for 5 minutes. Release pressure naturally according to manufacturer's instruction for 5 minutes. Release remaining pressure using the quick-release method. Open pressure cooker; stir in sour cream.